Gate of Tears is the latest political thriller from Lymington author James Marinero, featuring a psycho-logically damaged female Serbian terrorist, Maruska Pavkovic and an Australian gold mining entrepreneur, whose adventures unfold around the stralt between the Horn of Africa and the Middle East. This fast-moving, gripping plot also Involves ex-Royal Marine Baldwin, who is pitted against the psychopathic terrorist Maruska Pavkovic, in the politically volatile Red Sea arena in which revolutionary changes and betrayal by both government and intelligence services, leads to naval and aerial confrontation, with NATO and Israel teaming up on one side and China and Yemen forming their challengers. The 366 action-packed pages of this intricately written novel is said to be aimed at the techno-market of male readers, but would be of interest to anyone enjoying a well-written, fast-moving political thriller. 'Gate of Tears' (ISBN9780956842602) published by eZeebooks UK is available in paperback at £8.99. 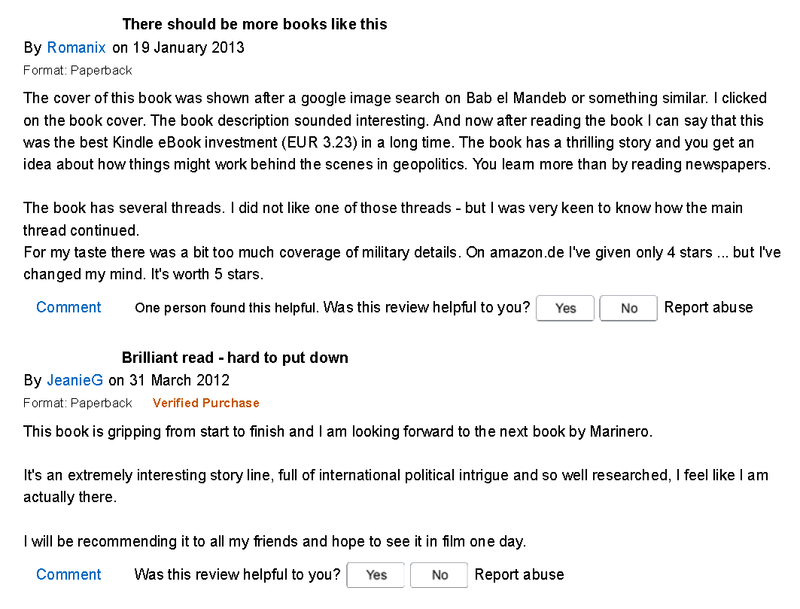 Gates of Tears is a first rate geopolitical thriller on a grand scale. Author Marinero sets the main action of the novel in 2017, allowing him to extrapolate current geopolitical, economic and technical conditions, abilities and trends to create the setting and background of the story. In the first forty percent of the book (I read the Kindle version) the plot is interrupted at times with back-story for the development of characters, their history and explanations of technical and geopolitical background and developments since 2011. Thereafter, the unfolding of the complex plot with its many interlocking parts is relentless. The amount of information packed into this book is truly impressive. There’s geopolitical history, the UK and Chinese political structures and cultures, military technology and practices (air, land and naval), gold mining history and technology, economics, commodity trading and much more. In the area of espionage central to the book, there is spy craft, tradecraft and field craft in convincing detail. This is the only thriller of which I’m aware that has a bibliography of sources. The amount of research that had to have gone into the book is simply awesome. To the extent that I have some knowledge of the things dealt with in the book, I found the information, both broad and detailed, to be accurate in the extreme. In areas with which I don’t presume to have complete knowledge, I found the book to be plausible. The characters in Gate of Tears, both major and minor, are well drawn and well developed. The villains are suitably psychopathic, but complex. The heroes are equally complex and suitable heroic without being saccharine. All the characters are believable. The true test of a thriller is its action. In Gate of Tears, the action is fast paced, hard, gritty and realistic. A lover of the genre couldn’t ask for more or better. I rate this book a 5 star must read. I can’t wait for the second in the series, The Sicilian Channel, to appear. We are promised more of the ex Royal Marine Steve Baldwin. I also hope we have not heard the last of the beautiful Albanian assassin with her many names. Lee Holz, author of the war on terror thrillers: The Abomination Assignment (#1) and The Honeymoon Assignment (#2) featuring Alice and Tom Bowin.